The main reason to use essential oil diffuser is give the soothing and relaxing scents and spread out over the room. Majority of the oil diffusers will evenly distribute the scents inside a room and come with good designs for easy use. It helps create the relaxing and pleasant environment that enhances the ambiance and mood in a room. Coming up with our top product list, we focus on reliability, effectiveness, versatility and maximum satisfaction of the users. 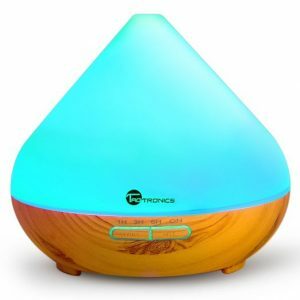 Read on the top 10 best aromatherapy essential oil diffusers and get an idea on the products that are worth buying. Just as the name implies, the Green Air SpaVapor aims at providing a green atmosphere that is not only healthy but also relaxing. This diffuser is made from BPA-free material that keeps the surrounding pure and clean. It’s suitable for the home, spa, studio, nursery as well as the office. Thanks to relying on advanced ceramic discs, you don’t need to worry about the item corroding or rusting internally. 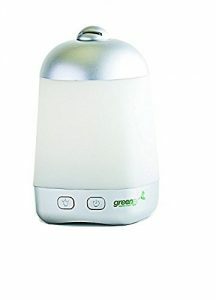 It comes with patented The GreenAir SpaVapor ultrasonic technology that produces and evenly distributes very fine mist. With a capacity of 150 ml, it is ideal for spaces of up to 250 square-feet. However, you will have to bear with the slight noise that can be heard especially when too close. The BellaSentials essential oil diffuser has a capacity of 400 ml. It can run for as many as 12 hours on slow mode and 8 hours on high mode. The diffuser is based on the ultrasonic technology that emits ultra-fine mist that disperses the micro vapor oil particles. It comes with attractive lighting and rotating colors that helps improve the ambiance inside the room. To prevent it from overheating or spoiling, it will automatically shut off when it runs out of water. People looking for very strong scent may find this diffuser not very effective. 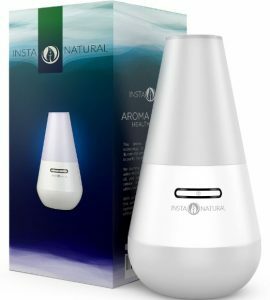 The Aromatherapy essential oil diffuser from InstaNatural is said to be one of the most trendy and modern-looking items. The European-designed object uses advanced ultrasonic technology that emits the essential oil in very fine mist. This ensures it reaches every corner of the room without making the atmosphere too misty. The easy-to-use diffuser is ideal for the office, gym, home and other places and produces minimal noise. It will offer you almost 5 hours of nonstop aromatherapy. When asked, most buyers said they would have preferred if the water tank was bigger that it currently is (100 ml). 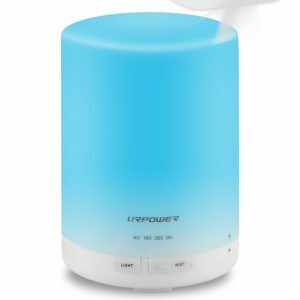 Good water capacity, elegant design, good mist dispersion and many hours of operation are the key reasons the URPOWER 300 ml makes it to the 10 best aromatherapy essential oil diffusers review. Its good carrying capacity (300 ml) provides up to 7 hours of non-stop aromatherapy. It features an AUTO Shut-off that is activated when the water level goes too low. Other good features include changing LED illumination (7 colors), 4 timer settings, ultrasonic air humidifier, ionizer and night light. However, the light may be a bit bright especially for those intending to sleep. 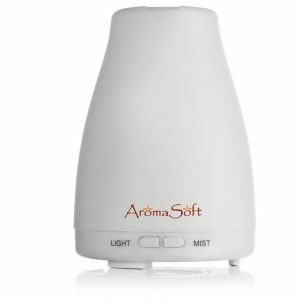 Fine Living proudly presents the aromatherapy essential oil diffuser by AromaSoft. It is one of the most powerful products but is still super silent. The 24- volt accessory easily produces fine mist that can cover large spaces and is ideal for the home, spa and other situations. You get to choose from either intermittent mode (cycles on and off every 30 seconds), or continuous mode that runs non-stop for hours. You also don’t need to use any special water as that from the tap can suffice. Its portability is attributed to its size which some people claim to be somehow small. 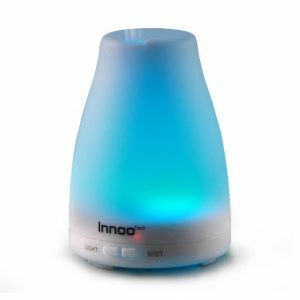 Although it’s not the most powerful, the Innoo Tech essential oil diffuser still produces a punch. It has a 100 ml capacity and also comes with changing led lights. Courtesy of the groundbreaking New Fan Technology, it is exceptionally quiet and is rated at 35 dB. This assures you of the desired quiet and peace. The diffuser manages to disperse the aroma quiet well and in large spaces spanning 15 square-meters. Areas where it can be used include baby room, home, spa, office, yoga rooms, and more. 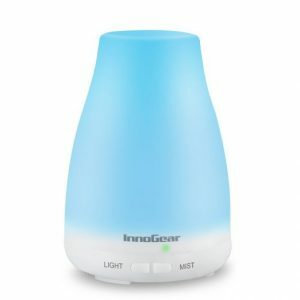 Creating the perfect mood and balance in a room can be achieved by acquiring the InnoGear diffuser. The 100 ml device is designed for aromatherapy and helping a user relax and relieve stress. It comes with a simple and portable design that makes it easy to carry and move around with. 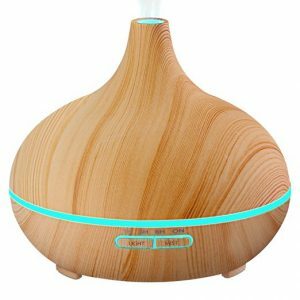 In addition to producing relaxing fragrances, the diffuser also comes with 7 changing LED lighting (Dark Blue, Green, Red, Pink, Yellow, Light blue, and White) for a better experience. When still new, you may find the top to bottom fit a bit too tight to open. 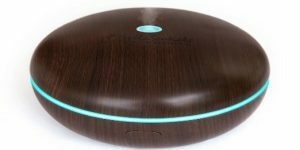 The TaoTronics 300ml Essential Oil Diffuser is the best ranked product in the market. Strangely, it shares many similarities with the second-best product (VicTsing diffuser). One, both have a 300 ml capacity and can run non-stop for about 10 hours. Two, the outer surfaces resembles wood grain that makes them very elegant. Three, the two products are small, compact and light but produce high-quality and ultra-fine mist. 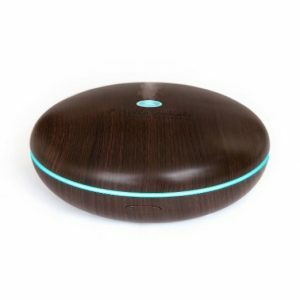 Other reasons for choosing the TaoTronics essential oil diffuser include; Ultrasonic humidifier, Auto Shut-off, Timer, 7 custom light (Aqua, Cyan, Yellow, Purple, Blue, Red, Green….) and versatility (homes, office rooms, bedrooms, Spas, Yoga studios, Gyms etc). If it wasn’t for the fact the LED lights can’t be shut-off completely, the VicTsing 300 ml would have been the best product. Nonetheless, it still scores better than other types due to its unique design that resembles wood grain. Besides looking authentic it’s also has a classic appeal. It’s also very portable and compact and comes with an easy to open and close lid. No need to screw or unscrew. The 300 ml tank allows the diffuser to run for nearly 10 hours since every hour consumes 30 ml. 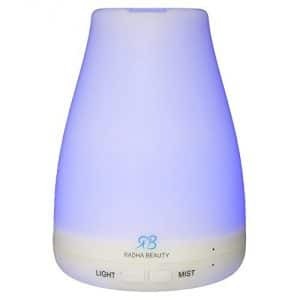 The Radha Beauty essential oil diffuser is a popular choice for people looking for good aromatherapy. It has a capacity of 160 ml and releases very fine mist for a longer time. For the best experience, the item also comes with a built-in ionizer that keeps the air clean, fresh and humid. Like other notable products, it also has lights that change periodically and assist in relaxation. The above products ensure to get the full benefits of aromatherapy and give you a very calm environment after a long day of tiring work. The listed items are made from high quality materials that will conserve the freshness of the essential oil and minimize any wastage. Furthermore, the handy devices come with several features that provide you with full control.